If you just can’t get enough pizza, choosing the appropriate wine to accompany your meal can enhance your entire dining experience. Here are some tips for finding the best wines to pair with your favorite meal. It can be just as rewarding to plan a date at home instead of going out for the night. After you have picked up the best pizza in Las Vegas and rented a romantic movie, you can take your date to the next level by selecting the appropriate wine to accompany your meal. Maybe you consider yourself a food connoisseur and you love discovering new flavors that can transform a mundane meal into an extraordinary culinary event, or perhaps you are simply searching for ways to impress a new date. Adding wine to your menu plan can enhance your entire evening experience. When it comes to pairing wine with a meal, you must first consider the primary ingredients. Pizza usually features earthy, robust flavors that often pair better with a red wine. 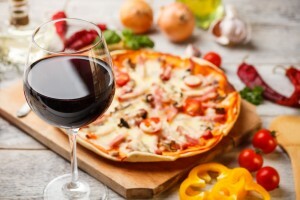 Consider the origins of pizza as well: not only is Italy world-renown in the art of creating the best pizza, they are also known for their incredible wines. Pick up a bottle of Italian wine and it will be almost impossible to go wrong. After you have decided on the right color to purchase, it is also a good idea to consider the fat content in the meal in order to choose the appropriate corresponding acidity content of the wine. Cheese and tomatoes both feature high acidity levels, so selecting a wine that features mid to high acidity levels will most likely pair the best. You should also ensure the wine has only moderate levels of tannin because combined with the flavors of robust tomatoes, it could produce a metallic aftertaste. Wine is not only a great flavor enhancer for pizza; it can also be perfectly paired with chocolate. Select a dessert that features rich, dark chocolate, as opposed to milk chocolate. This is the perfect way to complete your incredible dinner experience.